After a massive wall in Malaga, Spain (covered), D*Face is now in Asia where he just wrapped up this new mural in Tokyo, Japan. In town for the upcoming opening of his exhibition at Parco Japan, the stencil artist and his crew quickly painted this signature piece yesterday in the district of Shibuya. Continue reading for more images on this piece and then check back with us soon for more street art updates from Asia. 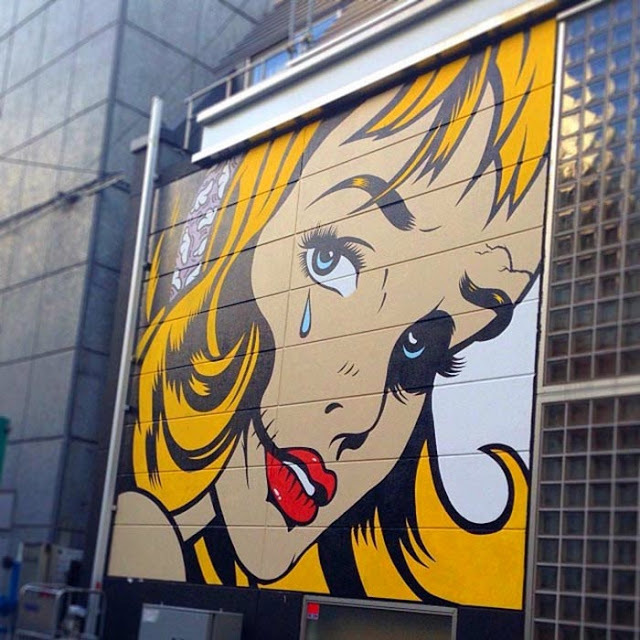 After a first piece on the streets of Tokyo (covered), D*Face is back in Shibuya where he quickly painted this new piece entitled “Goodbye Kitty”. The London-based street artist was in town for his exhibition at Parco Japan (coverage coming soon). Continue reading for more detailed images from our friend Mura-San and then if you are in Tokyo, you’ll be able to find it in front of 東京都渋谷区宇田川町４丁目３.